Plötzensee prison was built between 1868 and 1879 as a prison outside the Berlin city limits. Covering an area of more than 25 hectares (about 62 acres), it arose as a complex of structures for accommodating 1,200 inmates that included many open areas. 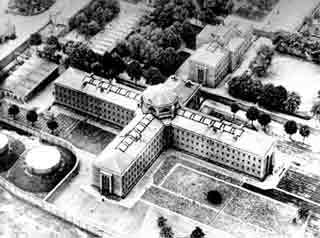 In addition to the prison buildings themselves, the red brick complex included administration buildings, service buildings, numerous work sheds, a prison infirmary, a chapel, and housing for prison staff. There was a significant difference between German penitentiaries and prisons. The penitentiaries were characterized by strict isolation and disciplinary measures, whereas prison inmates were generally convicts serving shorter sentences under less severe conditions. The aim of Plötzensee prison was to rehabilitate its inmates as opposed to exacting retribution from them. Shortly after the National Socialist takeover in 1933, prison discipline also became harsher in Plötzensee. The goals of the penal system were now retribution, deterrence, and the “elimination” of persons regarded as inferior. Plötzensee now serves as a facility for pretrial confinement for persons arraigned on political charges. Increasing numbers of such cases were prosecuted before the National Socialist Special Courts (Sondergerichte) created in 1933, before the political criminal tribunals of the appellate court, and before the “People’s Court,” established in 1934. From 1890 to 1932, a total of 36 persons convicted of murder were put to death with an executioner’s ax outdoors in the prison courtyard. In contrast, 2,891 persons fall victim to killings at the hands of the judiciary in Plötzensee during the 12 years of National Socialist terror from 1933 to 1945. Until 1933, only murder and severe felonies involving explosives were punishable by death; by 1938, 25 offenses involve capital punishment. From 1939 on, under the wartime special criminal law, the death penalty threatened even those charged with minor offenses. In the first few years from 1933 to 1936, a total of 45 people were put to death with an executioner’s ax in the prison courtyard in Plötzensee. On October 14, 1936, Adolf Hitler approved Justice Minister Franz Gürtner’s proposal that the guillotine be used for carrying out capital punishment in the future. A work shed was designated as the site of future executions in Plötzensee in 1937. Under strict secrecy, a guillotine was transported from the Bruchsal prison in Baden to Plötzensee and erected there. Thirty-seven persons were murdered with the new machine during the remainder of 1937; 56 were murdered in 1938, and 95 in 1939. The condemned prisoners were kept in the large cell block building (House III) directly adjacent to the execution shed. They spent their final hours in shackles in special cells on the ground floor, which the prisoners called the “house of the dead.” Their final steps took them through a small courtyard to the execution chamber housing the guillotine. In late 1942, the execution chamber was fitted with a steel beam to which eight iron hooks were fastened. This gallows was then used for hangings. The first to die here were members of the resistance organization known as the Red Orchestra. Later they were followed by resistance fighters involved in the attempted coup of July 20, 1944. The 2,891 people murdered in Plötzensee during the National Socialist regime included approximately 1,500 convicted by the “People’s Court” and about 1,000 convicted by the Special Courts. The other 400 victims were sentenced to death by the Reich Military Court; other military courts; but also the Reich Court, the appellate court, or other state courts. About half of those executed were Germans, most of whom were sentenced to death for acts of resistance against the lawless National Socialist state. However, the victims of the lawless National Socialist judiciary in Plötzensee also included many persons receiving death sentences as overly harsh punishment for minor offenses, especially after 1939. The judicial system was even more ruthless against foreigners convicted of a crime. Six hundred seventy-seven executed prisoners were from Czechoslovakia alone, which Germany occupied in 1938-39. The “People’s Court” convening in Berlin was generally responsible for the persecution of political resistance in Czechoslovakia, and this court handed down many death sentences. Two hundred fifty-three death sentences were carried out against Poles, and 245 against French citizens. These people included both members of resistance organizations and people who were deported to Germany for forced labor. After 1939, Plötzensee was the site where people from all parts of German-occupied territory die. During an air raid on Berlin in the night September 3-4, 1943, the blacked out Plötzensee prison was hit several times by Allied bombs and heavily damaged. As during every air raid, the prisoners remain locked in their cells without any defense against direct hits. Part of the large cell block building (House III) was destroyed. Many of the cell doors were torn open by the force of the explosions and, in the general confusion, four prisoners awaiting execution were able to escape. In early September 1943, a total of about 300 prisoners sentenced to death were confined in Plötzensee awaiting the outcome of pending clemency proceedings. On September 3, 1943, immediately before the heavy air raid on Berlin, Hitler complained to the Reich minister of justice about the long time involved in completing clemency proceedings. The ministry subsequently became intent on speeding up the executions in Plötzensee; however, the execution shed was also hit in the air raid, and the guillotine was severely damaged. The Reich Ministry of Justice received the names of prisoners sentenced to death by telephone on September 7, 1943. As Justice Minister Otto Thierack was away on official business, his state secretary Curt Rothenberger reviewed the cases and ruled on the clemency proceedings without waiting for the usual depositions. In nearly every case, Rothenberger ordered the sentence to be carried out and had the names forwarded to Plötzensee by telephone. In Plötzensee, executioner Reindl and his assistants prepared for the executions. In the evening, a Regional Court director representing the senior Reich prosecutor of the “People's Court” and a public prosecutor from the public prosecutor's office of the Regional Court, Berlin, arrived as “enforcement supervisors.” Because the guillotine was destroyed, the prisoners were hanged on the back wall in groups of eight. In the night of September 7-8, 1943, alone, 186 people died in this manner. Also, six prisoners whose clemency proceedings were still pending were “mistakenly” hanged. Reich Justice Minister Otto Thierack learned of the atrocious matter shortly thereafter. He had it covered up and ordered the mass executions to continue. After pausing for only 12 hours, the executioners in Plötzensee hung more than 60 additional victims during the following nights until September 12, 1943. More than 250 people were murdered between September 7 and 12, 1943, among them German, French, and especially Czech prisoners. Overcrowding, deficient and often insufficient nutrition, and delayed or withheld medical treatment combined to create chronically poor living conditions for the inmates in the second half of the war. Inmates were successively released in the spring of 1945. By the time the Soviet Army captured the facility on April 25, 1945, it was largely empty. In 1945, the Allies determined that Plötzensee should serve as a juvenile prison in the future. The large cell block building was not rebuilt, and House III was torn down. Instead, new structures were built to house juvenile offenders. Plötzensee still includes a prison infirmary. In 1951, the Berlin Senate decided to erect a memorial in Plötzensee. Architect Bruno Grimmek was entrusted with the planning. Portions of the execution shed were torn down, and a memorial wall was erected in front of it. The cornerstone of the memorial was laid on September 9, 1951; the memorial was officially inaugurated on September 14, 1952. Since that time, Plötzensee has become a place of silent remembrance commemorating all the victims of the National Socialist dictatorship.